Fishes are sensitive towards the temperature and the acidity of the aquarium. Some fishes require constant attention from the aquarium keeper. Not paying attention to the water conditions and nitrogen cycle could result in death of the fish. So you can guess how much you need to maintain the water quality. In order to keep the water quality there is need to maintain the test kit strips for your aquarium tank. Test kit strips can identify various parameters that affect your tank. Based on the results that strips gives, you can maintain the water conditions in your aquarium. There are plenty of aquarium test kits available but you should look for those which are easy to use and comes up with information that teaches you about water quality and test strip results. There is one such test strip that can provide you such information -and that is mardel test strips. These strips can be used for both saltwater and freshwater aquarium tank. These strips are useful for you to find out quality of the water and parameters that affect the aquarium. What you can do with mardel 5-in-1 test strips ? You can use these strips for both saltwater and freshwater aquarium tanks. It lets you monitor ph, hardness, alkalinity,nitrite and nitrate with the help of easy to read instruction and strip results. It is very easy to read the results and you can get the idea of quality of water immediately. There are no toxic materials used in the strips so they are safe to use while testing your aquarium water. In case of PH test there are other alternatives which you should use instead of mardel’s strips. Because the strips less likely to be consistent with the results so you should use other alternative side by side along with these strips. Why Mardel’s 5-in-1 test strips ? There are many low quality test tube tests or strips in the market but they lack in the accuracy of results. Mardel’s test results are easy to read and novice can understand to use. 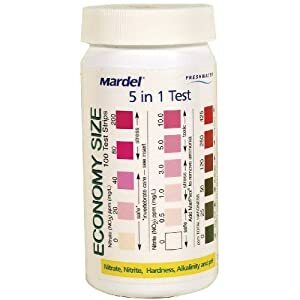 If you need to test your saltwater or freshwater aquarium then you should get mardel’s 5-in-1 test strips. These strips is all you need to maintain quality of your aquarium. Buy Mardel’s 5-in-1 Test Strips at Amazon.